The Blavatsky Trust video of the same name. 'Blavatsky' is a portrait of one of the most remarkable and fascinating women of modern times; the 19th. Century Russian mystic, Helena Petrovna Blavatsky. Destined for a solitary path, she left husband and homeland to travel the world in search of occult knowledge, a quest which ultimately took her to the great Mahatmas and the Ancient wisdom of the East. Her odyssey was to bring her enlightenment and enemies, fame and notoriety; devotion and denouncement ... but it also resulted in some of the greatest occult classics ever written, and the founding of the Theosophical Society. History has not been kind to the controversial Helena Petrovna and her passion for spiritual truth. But then history may be too short a time to give us a real perspective on the Immortals. For such the stubborn genius BLAVATSKY most certainly was ... and is. There is no danger that dauntless courage cannot conquer; there is no trial that spotless purity cannot pass through; there is no difficulty that strong intellect cannot surmount. Blavatsky, the inspiring force behind the founding of the Theosophical Society, never claimed to be the founder of any new religion or philosophy. She was, she said, only a transmitter, in modern language, of "a few fundamental Truths from the Secret Doctrine of the archaic ages". To be properly understood, Blavatsky must be seen as the bearer of a message; the spokesman for those wiser than herself, members of a Brotherhood of guardians and protectors of mankind who hold in their custody the ageless truths about man's spiritual nature, his origins and destiny. In her writings and teachings she had much to say that was, in the context of the current ideas of the time, controversial. It brought her calumny and condemnation, not only from the Establishment and Church, but from Spiritualists and even some disenchanted followers who, for their own ends, denounced her as a fraud. Yet time proves to be her friend. Science, which once decried her, increasingly seems to be "catching up" with what she taught, even claiming parts of it as their own! For this, however, Blavatsky would be the last to condemn them ... "We are brothers", she said, and so we should "love, help and mutually defend each other against any spirit of untruth or deception, without distinction of race, creed, or colour". There is only "one infinite, changeless Spirit of Love, Truth and Wisdom in the Universe, one Light for all". In 1831, in the Southern Russian province of Ekaterinslov, a daughter was born to the wife of Colonel Peter von Hahn; they named her Helena Petrovna. The Ukrainians believed in nature spirits, witchcraft, and magical customs and rites. Helena's birthday happened to be the one-day in the whole year on which those born were exempt from the persecutions of nature spirits and goblins. This resulted in her receiving some "secret" education in occult lore from her local superstitious nurses. Helena showed considerable psychic abilities at a very early age; she saw and talked with nature spirits. Younger children used to gather round her. She delighted in telling them weird and frightening tales of fearsome monsters and elemental creatures. She also told stories of the lives of the stuffed animals in her grandmother's collection. She had an indomitable self-will and a virtually uncontrollable temper. She passionately rebelled against all constraints of custom and conventionality, a characteristic she showed throughout her life and one that was the cause of much comment and criticism, even scandal later on. Her temper led her up the aisle. Her governess taunted her that no one would ever marry her. To show that this was not so, she inveigled a man three times her age - a Civil Administrator Nikifor Blavatsky - into marrying her. It was 1848, and she was only 17; the marriage proved disastrous. She quickly realized that the unconsummated marriage, which she hoped would have given her more freedom than that of a single woman, was a sad mistake. She fled after only three months, and, boarding a steamer to Constantinople, left the high society, luxury, and indulgent life she had led as an enfant terrible. This was the first stage of a long journey that took her to Egypt, Greece and other parts of Eastern Europe, Canada, and North and South America. She was searching for occult knowledge, an understanding of the inner powers in nature and man, some of which she possessed from a very early age. She sought to penetrate the deep mysteries of life; to find those who could instruct her and explain not only the nature of her own psychic faculties, but who could demonstrate other and greater powers that she felt the human being possessed. This search led her to many parts of the world where men practiced sorcery, witchcraft, necromancy and 'magic' in many forms. She became acquainted with the Spiritualism then sweeping America and elsewhere. These journeys provided her with a uniquely comprehensive first-hand experience of the occult, which was to become a major factor in her future work. Helena' s adventures around the world were many and varied. She suffered a terrible illness at Rougodevo in Russia in 1859. Later as a member of Garibaldi' s army she was wounded in the Battle of Mentana in Italy in 1867. At the end of that year she went to India, whence after some frustrations she succeeded in entering the., mysterious country of Tibet. For a time, all contact with her was then lost. From her childhood Blavatsky had talked of a mysterious but familiar ‘presence’, a majestic Hindu in a white turban, whom she knew as her 'protector' .He subsequently did save her from serious injury .She often went riding and on one occasion, her horse took fright and bolted. She was unseated; a leg became entangled in a stirrup. Instead of falling to the ground, being dragged along and almost certainly being seriously injured, she felt herself held up by invisible arms until the horse stopped. This was just one of a number of incidents when she felt this invisible 'presence' and was prevented from coming to harm. In 1851 she visited London with her father. While out walking one day, she saw a tall Hindu in a procession. She instantly recognized him as her 'protector' .She would have stepped forward to speak with him, but he indicated that she should not, and moved on. The next day while walking alone in Hyde Park, she saw him again. He approached her and told her many things. There was important work for her to do; she would have many problems and sufferings in her life as a result. Her 'protector' was a Mahatma, a high initiate in occult knowledge and power, an Adept, a Master of the Wisdom. The Masters of the Wisdom are an elite group of people who, through much training and enormous self-discipline, have developed their psychic and spiritual powers to an extent where they have completely mastered their ordinary human natures. They have become 'perfected' men and passed beyond the evolutionary stage of ordinary men. Some of them, instead of then passing onto superhuman realms, elect to remain, for a time at least, on earth to help and inspire us along our spiritual journey. They are our 'elder brothers' working behind the scenes and forming a 'guardian wall' against further and greater evils that could otherwise befall us. It was from these Masters that Madame Blavatsky received personal instruction. She learned of the secrets of Nature and was trained to control and use her already considerable powers. This was an apprenticeship to prepare her for a lifetime in the Master's work. In 1873 she travelled to Paris. From there she was sent to America by her Master to begin her great work. She arrived in New York on the 7th. July 1874. She saw in Spiritualism an opportunity to introduce, as she called it, "... a new cycle of occult research. " She had been accustomed to "ethereal affinities" since she was a child, but now she could manifest her mediumistic tendencies at will, unlike ordinary mediums that have no such conscious control. All over America, at that time, séances were big business, mediums inviting any 'spirit' in the post-mortem realms to "come through". The Spiritualists believed that what came through to the sensitive or medium was the soul or spirit of a dead person returning to give a message to some loved one left behind. This was the basis of a common belief in survival after death. HPB' s explanation was very different. Learned in the causes of the phenomena, she explained that the immortal spirit of a person could not, under any circumstances, revisit the earth after that person was dead. What the mediums were contacting were the discarnate psychic remains, the mortal souls, which are left behind in the astral world after the departure of the person's real spirit. These 'shells' can and do communicate when given the opportunity by a medium. HPB made it quite clear that the shells, or spooks as she called them, were "... soulless creatures, the shadows of their terrestrial bodies from which throve and preserved their semi-material shadows, at the expense of the medium's ". When these 'shadows' materialised at séances, the mediums were giving form unconsciously to pictures of the dead persons existing either in the minds of the sitters or in the 'astral light'. At first she saw in Spiritualism an opportunity to check the materialistic scepticism of the time, and so sided with them against material science. After all, Spiritualism did demonstrate that there are entities in the invisible world, whatever their nature may be. She hoped that this demonstration would provide an opportunity for her to present the philosophy of Occult Science to the world, through her explanations of their phenomena.
" Poets speak of the thin partition between this world and the other. They are blind: there is no partition at all except the difference of states in which the living and the dead exist, and the grossness of the physical senses of the majority of mankind. Yet these senses are our salvation; they were given to us by a wise and sagacious mother and nurse - Nature, for otherwise, individuality and even personality would have become impossible: the dead would be ever merging into the living, and the latter assimilating the former." HPB at first allowed herself to be thought of as a Spiritualist. But as it became clear that they rejected her explanations, and it became clear that it would not be possible for her to utilise the movement in the way which she and the Masters had hoped. "As it is, I have only done my duty,' first towards Spiritualism, that I have defended as well as I could from the attacks of imposture under the too transparent mask of science but I am obliged to confess that I really do not believe in having done any good - to Spiritualism itself - it is with profound sadness in my heart that I acknowledge this fact, for I begin to think there is no help for it." During a visit to a farmhouse at Chittenden in Vermont in 1874, where some remarkable phenomena of materialisation were taking place, she met a civil war colonel, Henry S. Olcott. He was there as a reporter for the New York Daily Graphic, investigating the phenomena being produced by two mediums, the Eddy brothers. His attention was drawn to HPB by her unusual appearance. Her Russian accent, striking Calmuck face and red Garibaldi shirt stood out in the drab surroundings. He struck up a conversation with her in French, and they immediately became friends. When HPB returned to New York she met him again. She explained to him the true nature of 'spirits', and the basic theosophical principles behind the phenomena, which he found so fascinating. Olcott introduced HPB to his friend William Quan Judge, a young attorney. Together they became her trusted pupils and received personal instruction in occult lore from her and the Master. HPB held meetings in her rooms at 46 Irving Place, New York. A mixture of lawyers, academics, prominent religious publishers, and Spiritualists attended these meetings. She was instructed by the Masters to form a society, and to choose Olcott for the task. Among the objects of the new Society was the investigation of spiritualistic and psychic phenomena. 2. No distinctions to be made by the members between races, creeds, or social positions, but every member had to be judged and dealt by on his personal merits. 3. To study the philosophies of the East - those of India chiefly, presenting them gradually to the public in various works that would interpret exoteric religions in the light of esoteric teachings. 4. To oppose materialism and theological dogmatism in every possible way, by demonstrating the existence of occult forces unknown to science, in nature, and the presence of psychic and spiritual powers in man; trying at the same time to enlarge the views of the Spiritualists by showing them that there are other, many other agencies at work in the production of phenomena besides' Spirits' of the dead. At first the Society did not flourish. The Spiritualists did not like the ‘truth’; the theosophical explanations about their spirits, and many Spiritualists who had joined the Society left it. But the founders were undeterred and from among a continual flow of enquirers, some began to take an interest in the Society's work. One of the most notable members at that time was the scientist Thomas Edison. A headquarters for the Society was established at 443 West 34th. St., and it was here that H.P.B. began the writing of her first great work Isis Unveiled.
" I wrote this last night by order, but what the deuce it is to be I don't know. Perhaps it is for a newspaper article, perhaps for a book, perhaps for nothing; anyway, I did as I was ordered". By 1877 the book was finished. It was a book of tremendous erudition. Those few early pages had grown into 1200, and in them she quotes from over 1300 separate sources, many of them from unknown obscure writers in various ancient and modem languages. It was a work intended to counteract the 'twin evils' at the time; materialism and Spiritualism. She tried to show that spiritualistic phenomena were not new, that the ancients knew and understood them. Her writings were re-statements of that Ancient Wisdom to which she later gave the name Theosophy. The book caused a furore, selling out within 10 days of publication. It provoked some excellent critical reviews. HPB described it as "A Master Key to the Mysteries of Ancient and Modem Science and Theology". Its purpose was to trace down through the ages the existence of a sacred knowledge and an occult tradition, which in essence is the science of Man, both in his outer relationship with the physical world, and in his inner relationship with the psychic and spiritual planes of the universe.
" If any book could ever have been said to make an epoch, this one could. Its effects have been as important in one way as those of Darwin' s first great work have been in another: both were tidal waves in modern thought, and each rendered to sweep away theological crudities and replace the belief in miracle with the belief in natural law." But how was she able to gather together this remarkable collection of information from so many different cultures, religions and philosophies? "Whence did she get this knowledge? That she had it is unmistakeable; whence did she get it? Not from her governesses in Russia; not from any source known to her family or most intimate friends; not in any college or university, for she never matriculated at either; not in the huge libraries of the world ... then whence did HPB draw the materials which compose Isis and which cannot be traced to accessible library sources of quotation? From the Astral Light, and by her soul-senses, from her Teachers - the 'Brothers', 'Adepts', 'Sages', 'Masters', as they have been variously called. How do I know it? By working two years with her on Isis …"
On December 18th. 1878, Blavatsky and Olcott left New York for India, where she immediately set to work promoting Theosophy and the Theosophical Society. India, in the late 1870s, was a vast and fascinating world of contradictions, where the ancient East met the western influences of the British Raj. There was the contrast, which still exists to this day, between the extremes of poverty and wealth, between high learning and ignorance, set in a country of great beauty and magic. They arrived in Bombay on Feb. 16th. 1879, where local theosophists greeted them, and it was here that they made their first base. These westerners who came to revive their great traditions, their ancient religions and philosophies soon fascinated the Indians. They revived an interest in Sanskrit in which their ancient religious treatises are written. One aim of the Theosophical Society was to offer resistance to the spread of materialism that came by way of modern science and dogmatic theology. They soon formed friendships with progressive Indian groups who showed an interest in Theosophy. HPB despised the contempt of one cast for another and the lofty and too often arrogant way in which one class looked down on another. She spoke to all when she said, "You are Divine, children of the One Father, and members of the great brotherhood of mankind". They toured India to arouse interest in the Society, and to form local branches. They spoke to all religionists; Hindus, Parsis, Buddhists, Jews, Mohammedans, and Christians, visiting many places; Allahabad, Cawnpore, Bhutpore, Jeyporr, Agril, Simla and many others. It was during this journey that they adopted the family motto of the Maharajas of Benares for the Theosophical Society "There is no religion higher than truth ". After about three years in India, they decided, with the Master's approval, to establish a headquarters for the society at Adyar, near Madras. They moved in on 17th. December 1882. Throughout her life H.P .B .had been surrounded by phenomena. We have already seen that she was trained to control her psychic faculties; she could cause bells to ring, furniture to move and objects appear as she willed. One of the most famous examples was during a picnic when an unexpected extra guest appeared and they were short of a cup and saucer for him. HPB sent some of the servants and guests to a nearby tree. When they dug into the ground at its roots, they found a cup and saucer which matched precisely the very set they were using. The most important phenomena, however, were the letters, written to her and others, by the Masters. Their content was largely the teachings they then wanted to promulgate. Although the two Masters mainly responsible for the letters used very unusual means for their production and transmission, they were living men known and seen by their pupils and others. Handwriting experts have examined the letters, and not only found that the ink, which should have faded to yellow by now, 100 years on, is still as dark and clear as the day they were produced. They have concluded, from what evidence remains, that the letters were, in fact, in the handwriting of the Masters concerned. The means of production of the letters is known in theosophicall terms as "precipitation’, whereby the words which were formed within the paper itself by the Masters, the words being impressed into the paper by a process involving strong imagination and powerful will. The materials necessary were drawn from the psychic surroundings. These 'flesh out' the mental images that he, the sender, has created, translating them from the world of ideas into the world of form. To all those whom this may concern - to the honourable and doubting company. Foolish are the hearts who doubt of our existence! or of the powers our community is in possession of for ages and ages. Would that you would open your hearts to the reception of the blessed truth, and obtain the fruits of the Arhatship if not in this then in another and better rebirth. Who is for us - answer! Do you believe that because you have fathomed, as you think, my physical crust and brain, you have ever penetrated even the first cuticles of my Real Self? You would gravely err if you did. I am held by some as untruthful because 'til now I have shown the world only the exterior Mme. Blavatsky. It is like complaining of a moss and weed covered, muddy, stony rock for writing outside, ‘I am not moss covered and mud plastered; your eyes deceive you, for you are unable to see beneath the crust! ' You must understand the allegory. It is not boasting; for I do not say whether inside that unprepossessing rock there is a palatial residence or a humble hut. What I say is this: you do not know me; for whatever there is inside, it is not what you think it is. And to judge me therefore, as untruthful, is the greatest injustice. I, the real inner 'I' am in prison, and cannot show myself as I am, however much I desire to. In her travels, HPB. had reached Cairo in I870 after surviving a shipwreck. While she was waiting for funds to arrive from Russia, she was helped by a Mme. Coulomb, who with her husband turned up in Bombay in 1880, destitute and begging her for assistance. HPB sheltered them for a time, and then she invited them to Adyar as housekeeper and handyman. Mme. Coulomb was constantly trying to raise money, and when an Indian Prince complained that Mme. Coulomb was attempting to blackmail him for a large sum. HPB intervened and put a stop to her scheming. Mme. Coulomb swore revenge. At Adyar, HPB had had a cabinet built in a room called the shrine room. It was in this cabinet that letters from the Mahatmas would appear. One time, while HPB was away, the Coulombs cut a hole into the back of the cabinet, through the wall, and into a wardrobe in her bedroom next door. This made it appear as though HPB was putting the letters through the hole and into the cabinet herself. The couple claimed that the letters were not messages from the Masters at all. They even forged some letters themselves to make it appear that HPB was colluding with them in this deception. Unfortunately, these claims coincided with an investigation into the phenomena at Adyar by Richard Hodgson, of the Society For Psychical Research, who, during his less-than-thorough enquiries, was taken in by the Coulomb evidence. He decided that HPB was a fraud. The publication of the S.P.R. report in England provoked much bad publicity, both to her and the Society. She returned to India determined to sue for slander, but the Executive Committee of the Society would not back her. Olcott managed to persuade her from taking the matter to court. After having resigned her editorship of the magazine The Theosophist, which she had founded, on March 31st. 1885, she left India never to return. Mme. 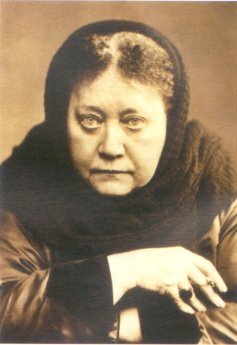 Blavatsky arrived in Italy in April 1885, where she remained for several months regaining her strength sadly depleted by her experiences at Adyar. From there she went to Wurzburg in Germany, where she stayed at Ludwig Strasse No.6. Here she began writing her magnum opus The Secret Doctrine. At first she set out to write a revised version of Isis Unveiled, but it soon became clear by the size and scope of the material, that it was to be a completely new work. "The aim of this work may be thus stated: to show that Nature is not 'a fortuitous concurrence of atoms, and to assign man his rightful place in the scheme of the Universe; to rescue from degradation the archaic truths which are the basis of all religions; to uncover, to some extent, the fundamental unity from which they all spring; finally, to show that the Occult side of nature has never been approached by science or modern civilisation". An extract from her Preface to the first edition of The Secret Doctrine. This huge work was, like Isis, of immense erudition: some 1400 pages in two volumes, in which she quotes from 1100 other works. It is a synthesis, representing the Wisdom of the Ages known by the few from time immemorial, which she called 'the perennial tradition’. She took material from remote ages, and integrated it with the new, in a modem setting. Its two volumes were first, Cosmogenesis, which looks at the birth of, and subsequent development of the cosmos, its spiritual origins, cyclical processes and Laws, and its hierarchical structure. The second, Anthropogenesis, deals with the birth of Man and his evolution during millions of years on this planet. The culture of the 19th century was dogmatic not only in theological thinking, but also in the assertions of science. Scientists then believed there was really nothing more to discover in nature. The Secret Doctrine pre-empted many scientific discoveries such as the divisibility of the atom, and those that show that the whole fabric, the edifice on which we constructed our view of physical reality, was basically energy. The manifest world, in all its diversity, was derived from differentiations of one Element, a kind of primordial plasma, and relative to the Ultimate unchanging REALITY, The Secret Doctrine shows that all temporary existence is Maya - illusion. The book was finally completed and published in 1888 in London where she had settled. It has been in print continuously ever since. Mankind is on a long, long pilgrimage to perfection. This 'spiritual journey' is a process which takes us through the evolutionary stages of growth from human to superhuman states of consciousness. However, we can consciously assume control of, or become responsible for our spiritual development. By this intervention we can speed up the process, but it is difficult and painful. However, humanity as a whole must eventually tread this ‘path’, as part of planned evolution through long cycles of gradual development. Blavatsky's priceless work The Voice Of The Silence (1889) was written to guide aspirants to individual spiritual attainment. It was translated from 'The Book Of The Golden Precepts '; an ancient work of unknown origin, which describes the nature of 'the path’; the disciplines required, and the pitfalls and dangers that may be encountered on the way to the conquering of the lower self. This culmination of her teaching is written as an exquisite prose poem. It reveals the way to the supreme mystical achievement, that of finding the Self, the God within each of us. Published in the same year was another great work, The Key To Theosophy that is of special significance to students. This is a practical textbook, in a question and answer format, which deals with a wide range of theosophical subjects. It traces the broad outlines of the Wisdom Religion, and explains its fundamental principles, such as the constitution of man, reincarnation, life-after death, Karma, and the purpose of the theosophical movement. It also deals with the application of Theosophy to the affairs of the world; to problems occurring in everyday life; education, social reforms, right behaviour etc. The Key To Theosophy is written in a language that makes Theosophy accessible to those who have newly encountered the subject. It has a helpful comprehensive glossary .It represents the full range and depth of subjects which HPB's works cover, and is a key to unlock the door to the deeper study of this immense subject of inestimable importance to mankind. "… the science of sciences ... the shore less ocean of universal truth, love and wisdom, divine nature, visible and invisible,' the aggregate of the knowledge and wisdom that underlie the Universe ". Theosophy is not a religion, but describes a unity of truth that flows through and links all the spiritual teachings of the world. "It is the root and trunk of the tree of which all religions are branches" and she described The Secret Doctrine as "The Synthesis of Science, Religion and Philosophy". HPB encouraged everyone to look beyond the surface of the great religions, to discover the One Truth, that truth which forms a common background to them all, It is Theosophy, the Ancient Wisdom, the Perennial Philosophy as Huxley called it. A unanimity of experience and thought is to be found amongst early Christian, Hindu, and Buddhist mystics, including St. John of the Cross and many others. As there is only one truth, it is not surprising that, although they used different words to describe their experiences, what they were all describing was essentially, the same. But this experience has been largely lost, repressed or distorted by the many dogmatic religions. A major part of HPB's work was to restore this knowledge, and its associated ancient teachings, to the world. As she was based in England for much of her work, she ran into criticism and resistance to her ideas from the institutional theologists of the late 18th Century, and especially some of the Christian authorities who reacted strongly against her. The following extract from a letter by her to the then Archbishop of Canterbury illustrates the position she took regarding religions and the church. "We are accustomed to say to the Buddhist, the Mohammedan, the Hindoo, or the Parsee: 'The road to Theosophy lies, for you, through your own religion.' We say this because those creeds possess a deeply philosophical and esoteric meaning, explanatory of the allegories under which they are presented to the people; but we cannot say the same thing to Christians. The successors of the Apostles never recorded the secret doctrine of Jesus - the 'mysteries of the kingdom of heaven' - which it was given to them (his apostles) alone to know. These have been suppressed, made away with, destroyed. What have come down upon the stream of time are the maxims, the parables, the allegories and the fables intended for the spiritually deaf and blind, to be revealed later to the world, and which modern Christianity either takes all literally, or interprets to the Fathers of the secular church. In both cases they are like cut flowers: they are severed from the plant on which they grew, and from the root whence that plant drew its life." HPB had many personal difficulties. She always suffered from poor physical health, injuries, and several serious illnesses during her life. She was frequently short-tempered. This was partly due to her physical suffering, but some resulted from an abnormal alteration to her principles made during the intense occult instruction she underwent with the Masters in Tibet. But those who knew her saw the real HPB as a very kind, wise, and generous individual, and there were many instances of her selfless nature. One particular example occurred in 1889 when she was on her way from England to New York. She was about to embark on a steamer when she met a poor woman and her two young children on the quay. The mother was very distressed as she had been swindled out of her travelling money when she purchased counterfeit steamer tickets; she was now stranded, penniless, unable to join her husband in New York. HPB, who had a first class ticket, traded in her ticket for steerage ones for them all. Steerage on a steamer in the 1800s was very basic, cold and uncomfortable, and the change from first class would have been a great personal sacrifice to her, yet typical. But why did the Masters choose such a physically handicapped woman? Their reply to this question was that they had searched for nearly a century to find someone suitable to send out into the Western world to convey their message. They said that "she was not the best, but the best available". She was an 'amanuensis', an assistant who takes dictation, a channel for their teachings. She was unique in that she had both the intellect to understand the material, and the ability to put profound ideas into a suitable literary form, and as far as possible, in language that could be readIly understood. She also had extraordinarily developed psychic powers which enabled her to see into the universal memory, the 'astral light' as she called it. This is Nature's memory which records everything that has ever happened during this cycle of the world's history. Its cosmic counterpart, the everlasting universal memory is sometimes referred to as the 'akashic records'. It was by drawing on this astral light memory that the Master was able to show her the copious references she needed for The Secret Doctrine, and which she wrote down during long and exhausting sessions often involving periods of great mental exertion. At the time when H.P.B. was writing The Secret Doctrine in the 19th century, the atom had not yet been split, and no theories of sub-atomic particles and quantum physics had been expounded. As with any revolutionary thinker, she was up against dogmatism, caught between science and orthodox religious theology. Although science was once much more of a spiritual discipline which had grown out of the mystical traditions of such men as Plato, Aristotle and Pythagoras, by the end of the 19th. century the climate of scientific thinking had become materialistic and mechanistic. God was reduced to 'the ghost in the machine'. And yet Blavatsky was already saying that the essential nature of matter was energy, and that the apparent solidity associated with the atom and matter was an illusion. This idea, that matter is simply a different form of energy, was prevalent in the whole ancient tradition, and it was to be validated by the work of Einstein and others in the years to come. It is interesting to compare two descriptions of the beginning of the cosmos. One given by Blavatsky in The Secret Doctrine and the other by Robert Jastrow, director of the Institute of Space Studies.
" Darkness radiates light, and behold, unparalleled refulgent glory,' bright space, son of dark space, "
" Picture the radiant splendour of the moment of creation, suddenly a world of pure energy flashes into being. Unimaginable brightness fills the Universe." Blavatsksy paints a picture of the beginnings of the cosmos that can be compared to the modem theories of , its origins such as 'The Big Bang', almost 100 years before. "...The Secret Doctrine contains all that can be given out to the world in this century (the 19th.) one by one facts and processes in Nature's workshops are permitted to find their way into the exact Sciences, while mysterious help is given to rare individuals in unravelling its arcana there will be a large rent made in the Veil of Nature, and materialistic science will receive a death blow ". HPB had difficulties with her health all her life. Although her teachers were hard task-masters, they gave her the choice of continuing with the work, or, having already done more than could reasonably have been expected of her, of withdrawing from it. She decided to continue. "Master has been here; he gave me my choice, that I might die and be free if I would, or I might live and finish The Secret Doctrine, He told me how great would be my suffering and what a terrible time I would have before me,' but when I thought of those students to whom I shall be permitted to teach a few things, and of The Theosophical Society in general, to which I have already given my heart's blood, I accepted the sacrifice,. and now to make it complete, fetch me some coffee and something to eat, and give me my tobacco box. " When Col. Olcott visited her in London in September 1888, he found her "working with desperate pertinacious energy at the completion of The Secret Doctrine, notwithstanding that, by all the laws of pathology and medical science, it was a miracle that she was alive at all." But with the Master's help, she was to survive for another 3 years, and produce not only The Secret Doctrine but several further writings including The Key To Theosophy and The Voice of the Silence, and many articles. 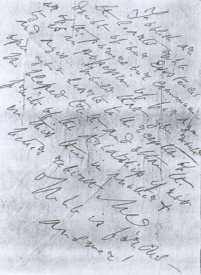 The following letter to Mrs. Sinnett sums up her feelings towards life: after she had virually been expelled from India, given up her editorship of the Theosophist, which magazine she had started, then been subjected to continual vilification and calumny - "my heart is broken physically and morally. For the first I do not care; Master shall take care it does not burst, so long as I am needed; in the second case there is no help ... I was ready to shed the last drop of life in me, give up every hope, for the last shred of -I shall not say happiness - but rest and comfort in this life of torture, for the cause I serve and for every true Theosophist. " On the 8th. May, 1891, H.P. Blavatsky died at 19 Avenue Rd., St. John's Wood, London. Her last words were typical of her life's devotion to the Master's work. " Keep the link unbroken...do not let my last incarnation be a failure ". Colonel Olcott wrote a tribute to her after her death:"HPB's enthusiasm was aflame at which all our Theosophists lit their torches, an example which stirred one's blood like the sound of a war trumpet! It is no wonder that I have loved her as a friend, prized her as a teacher, and for evermore kept her memory sacred". "When the artificial chilly flame of modern materialism is extinguished for lack of fuel, those for whom the great hope of existence beyond the grave is a vexation, should prepare for the greatest disappointment they could possible have. For out of the deep muddy waters of materiality, a mystic force is rising. It is but the first rustling, but it is a superhuman rustling - it is supernatural only for the superstitious and ignorant! The Spirit of truth is passing now over the face of dark waters; and, in parting them, is compelling them to reveal their spiritual treasures,. and this spirit is aforce that cannot be hindered, and can never, never, be stopped". some aspects of the teachings in the form of questions and answers. Invaluable to the enquirer. FOUNDATIONS OF ESOTERIC PHILOSOPHY: A small compilation of the essential teachings extracted verbatim from the principal works of H.P. Blavatsky. DEITY, COSMOS AND MAN by G.A. Farthing. This article was originally produced as a booklet to accompany the Blavatsky Trust video of the same name, and is intended as a brief history of the life of HPB. First published 1994 by The Blavatsky Trust.